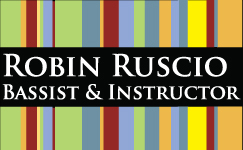 Robin Ruscio is a freelance acoustic and electric bassist in Denver, Colorado. He performs a wide variety of music including jazz, classical, latin, swing, funk, rock, and pop. He also runs a private instruction teaching studio, offering double bass and electric bass lessons for all ages and abilities.